It was obvious that Eric Huxtable was destined for football stardom from his first senior game as a 15 year-old for Tasmanian club New Town in 1924. Four years later, he won New Town’s inaugural Best and Fairest award, and had notched up 100 matches before he agreed to cross Bass Strait and join Carlton in 1930. While at New Town, ‘Huxie’ showed time and again that he was a natural, gifted defender. Although only 180 centimetres (or 5 feet, 11 inches) tall, he developed into the island state’s best centre half-back, where his anticipation, big leap and tenacity made him a daunting opponent. Balanced and strong overhead, he was also a driving drop-kick on the run. At Carlton, he took to a half-back flank with such poise that he was selected in a VFL representative team before his 40th senior game. Eric was a proud Tasmanian, but this was long before the advent of State of Origin matches, so he consoled himself with the knowledge that he was representing a league, not a state. He was eventually selected at half-back in seven games for the Big Vee, in 1932, ‘34 and ‘35, and it was during this time that a South Australian newspaper dubbed him ‘Untouchable’ Huxtable. After playing finals football in his debut season, Huxtable’s career took a big step forward when he picked up Fitzroy’s boom recruit Haydn Bunton for the first time in 1932. Bunton was destined to win three Brownlow Medals and three Sandover Medals in a glittering career, and he would quickly be recognised as one of the game’s all-time greats. But right from their first meeting, one defender that Bunton couldn’t dominate was Huxtable of Carlton. Their first match-up was a classic duel, and for five seasons afterward, each of their meetings was eagerly anticipated by supporters of both sides. In October 1932, Carlton made it through to the Grand Final for the first time in 11 years. And in a fierce, desperate match against Richmond, Carlton was just in front with five minutes to go, but the Tigers finished harder and won by 9 points. ‘Huxie’ stood tall for the Blues in that heart-breaking defeat, to be named with his captain Colin Martyn, fellow defender Gordon Mackie, and wingman Leo Opray as Carlton’s best contributors. Over succeeding seasons, Huxtable built on his reputation as a reliable big-match player. The Blues continued to be regular finalists, only to be bundled out of contention at the Semi Final stage in 1933, 1935 and 1936. 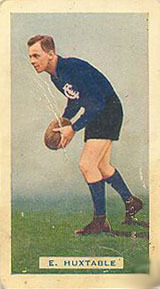 By 1938, Eric may have been one of Carlton’s veterans, but he was one of the first Blues singled out by Carlton’s new captain-coach Brighton Diggins as an example to his team-mates of what was required from then on. Cruelly, Huxtable then injured a thumb mid-season. He soldiered on as the Blues mounted a charge for the ’38 finals, and sat on the bench as 19th man when Carlton impressively knocked over Geelong by five goals in the second Semi Final. That win set up a Grand Final showdown with Collingwood, but also marked the end of Eric Huxtable’s career at Princes Park. Eric’s thumb was damaged further during that victory over the Cats, and he was ruled out of Carlton’s Grand Final team. With mixed emotions, ‘Huxie’ watched the Blueboys claim Premiership number six with a clinical 15-point victory over the ‘Pies. In 1939 he accepted a position as playing coach with Gippsland club Yarram, reportedly worth more than £10 per week, and with a prospect of a permanent position with the Yarram Council. Although Carlton was reluctant to lose a brilliant footballer, the club eventually endorsed his clearance. A year later, under their fanatical leader Adolph Hitler, the Germans went to war in Europe for the second time in 25 years, and Australia was soon involved. Eric promptly enlisted in the RAAF, but while waiting for his call-up, was approached by his former Carlton team-mate Joe Kelly, who was appointed senior coach at South Melbourne in 1941. Kelly convinced Huxtable to make a comeback with the Swans, who were struggling to field a competitive team each week because most of the club’s senior players were already in uniform. Eric eventually agreed, and although he was 33 years old by then, he gave South valuable service in 22 matches over two seasons. After the Round 3, 1935 Carlton-Richmond match, Huxtable was awarded one of two Olympic silver medals presented to the club by Councillor Frank Beaurepaire, and inscribed with Carlton's motto "mens sana in corpore sano". Jack Hale received the other medal, given to Carlton’s best players in the game. At the Carlton Annual General Meeting of February 1938, Eric was awarded Life Membership "in recognition of his service as a member of the team." Huxtable was appointed coach of the Sunshine Under-18 team in March 1953. He had previously led Sunshine to a premiership as playing coach in 1946, and stayed in on until 1947. In 1953, an N.W. Huxtable is listed as joining the Blues under the father-son rule, and his brother G.T.Huxtable* followed in 1957. It is a fair assumption that these were both sons of Eric, so the Blueseum’s research continues. The Sunshine Advocate reported that a G. Huxtable was named in the Sunshine Fourths team on July 23, 1954. Contributors to this page: blueycarlton , Jarusa , PatsFitztrick , Bombasheldon , molsey , tmd1 , true_blue24 , WillowBlue and admin . Page last modified on Sunday 10 of September, 2017 11:03:12 AEST by blueycarlton. 1983 - Snippet on Ken Sheldon. 1984 Rd 14 - Rod Ashman protects the footy.